On Aug. 4, at approximately 2:06 a.m., deputies from the Rock County Sheriff’s Office were dispatched to the area of N I-43 and E. Hart Road in the Town of Turtle, for a check welfare on two individuals standing near the round-a-bout with no vehicles present. 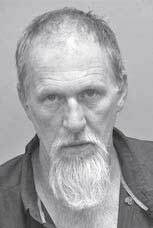 Deputies made contact with, 65-year-old Dennis Draves of Clinton and his 38-year-old girlfriend Virginia Hall. Investigation revealed Draves had ridden his motorcycle from Janesville, to the incident location. Hall showed signs of intoxication and was transported by ambulance to Beloit Memorial Hospital. Draves showed signs of impairment, and the deputy asked Draves to perform field sobriety tests. Draves was subsequently arrested for felony 8th offense Operating While Intoxicated, Operating after Suspension and Expired Registration. Draves was transported to the Rock County Jail, where he was held for court on Aug. 6 at 3 p.m.